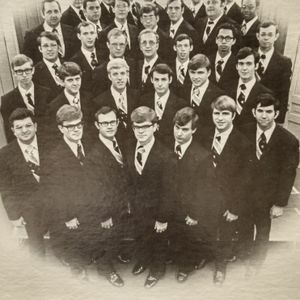 Recording by The Singing Men of Temple of Tennessee Temple Schools in Chattanooga, Tennessee (1975). Directed by Mrs. Fred Brown. Songs included: Brethren We Have Met To Worship, A New Name In Glory, Glory To His Name, Glorious Things, The Lord&apos;s Prayer, Gloria In Excelsis, Glory To The King of Kings, Purer In Heart, O God, Deep River, Behold I Show You A Mystery, When The Shadows Flee Away, and God Bless America.